Yes, I fell victim to the clickbait. I couldn’t help it; it was the top reasons to hate the Seahawks, written by a San Francisco columnist. I was curious as to how this list would go; the Niners had an off-year, and nobody really asked them what they thought. But everyone is entitled to have an opinion, which I can respect. But here is a point by point rebuttal as to why you’re wrong. I did my best to stay objective because that’s what I’m learning as a journalism student, but at times you made it very, very tough for me to remain objective. 1. Richard Sherman is the worst (could he be anymore obsessed with Michael Crabtree? No, no he could not.). First off, that rant against Crabtree occurred over a year ago. Ergo, irrelevant. Secondly, Sherman calling Crabtree ‘mediocre’ in the NFC championship game was proven when Crabtree’s 2014 season consisted of these statistics: 68 catches, 698 yards and four touchdowns. Meanwhile, ‘pedestrian’ Doug Baldwin finished with a stat line of 66 catches, 825 yards and three touchdowns. Fairly comparable stats. For the tiebreaker, we will compare dropped passes. Crabtree finished with seven drops (12th highest in the league) in 108 passes thrown his way, also known as a 6.5 drop percentage. Baldwin finished 109th in the league with three drops in 98 passes, or 3.1 drop percentage. Simple mathematics teaches us that ‘pedestrian’ > ‘mediocre’. Really? Gum chewing? No rebuttal necessary. 3. The Seahawks are cheaters. What’s worse, taking PEDs or deflating the ball a little bit and still winning by 38? Let me hit you with some knowledge. Since the Seahawks’ last player was suspended for PEDs (Bruce Irvin), 27 players have been suspended for violating the PED policy. Since the last Seahawk was suspended for substance abuse (Brandon Browner), 40 players have been suspended across the NFL. The “Seadderall Cheathawks” was funny in 2012, WHICH WAS THREE YEARS AGO. Aaron Hernandez, anyone? Or Aldon Smith? Ray McDonald? Oh, I’m sorry, McDonald doesn’t play for the 49ers anymore. 5. Uh… this guy. 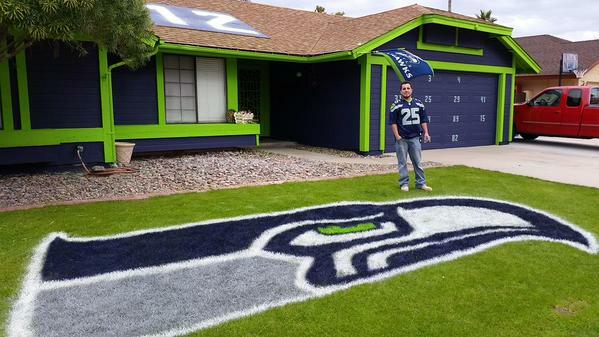 You’ll almost feel bad for him if the Seahawks lose. HAHAHAHA. No, no you won’t. 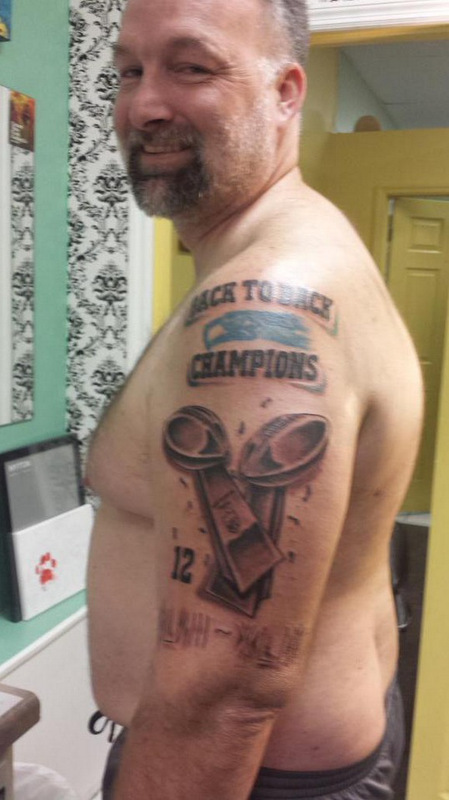 Granted, the tattoo might be a little premature, but it’s not like he’s the first one to ever get a tattoo predicting a championship. Also, chances are slim you’ll ever meet the guy. 6. They stole the “12th Man” thing from Texas A&M. “Stole” is a strong word. Yes, the Seahawks use the phrase. Yes, the Seahawks pay to do so. But the #12 jersey has been retired since 1984, the only jersey dedicated to the fans across the NFL. 7. 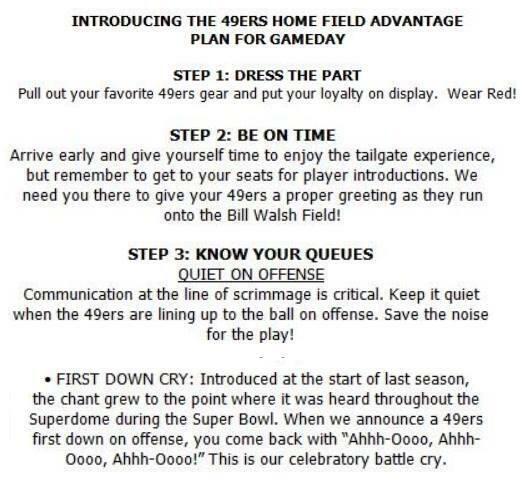 They constantly break basic fan rules .Like leaving the NFC Championship against Green Bay early, only to be locked out while Seattle came back. Real fans stay until the game is over. Fact. Yes, let’s focus on the 10,000 fans who left and not the 58,000 who stayed. It was a bad job by the fans who left, no doubt. 8. Marshawn Lynch is an a-hole…because he won’t talk to the media. The real a-holes are the reporters who continually hound Lynch for a quote. What’s the definition of insanity? Doing something again and again while expecting a different result. Lynch is nothing but upfront about his media policy. 9. Their fans insist that they’re sooo loud when it’s really just the stupid stadium. The stadium helps, sure. But it’s only the 20th largest capacity in the NFL, and it wasn’t the stadium that caused the first snap in Super Bowl XLVIII to go over Manning’s head because the center COULDN’T HEAR THE SNAP COUNT. Also, the team doesn’t need to send out letters to fans like this one. Let the man live the way he wants to live. You don’t like his house. I promise you he doesn’t like your list you compiled here. Life goes on. 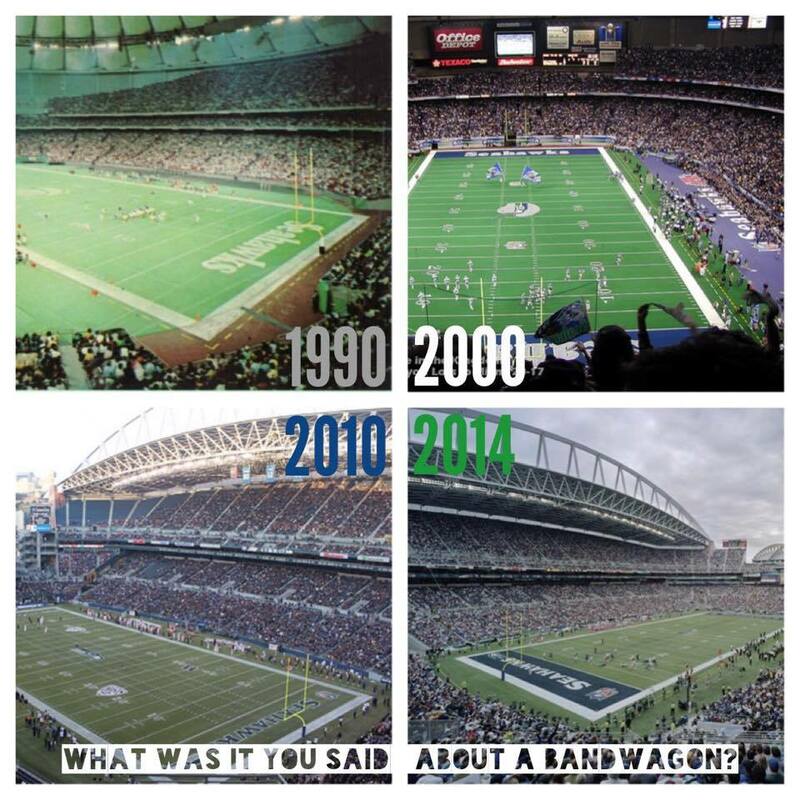 Your ignorance of Seahawks’ fans does not a bandwagon make. Two thoughts: 1. The ref admitted he kicked two calls, impacted the game. 2. The last Super Bowl the 49ers won was 20 years ago. A true 49ers fan wouldn’t be caught dead even pretending to root for the Seahawks. Thanks for asking.